Early announcement for all the Teen Titans Go! fans: Eat. Dance. Punch! Season 3 Part 1 hits DVD on May 31, 2016. The two-disc set packs in four hours of Teen Titans fun in 26 episodes. Teen Titans Go! is an often riotously funny take on the lighter side of DC Comics’ characters Robin, Cyborg, Raven, Starfire and Beast Boy. The third season began airing in July 2015 and continues to remain a popular Cartoon Network fixture, thanks in large part to its blending of sophomoric kid-friendly humor and parody elements that appeal to older viewers. Now granted, Warner Bros. didn’t exactly elaborate too extensively on the series’ concept but that’s enough to convey the general idea. Let’s turn to Mary Ellen Thomas, WBHE Vice President, Family, Animation & Partner Brands Marketing, for further comment on Teen Titans Go!. 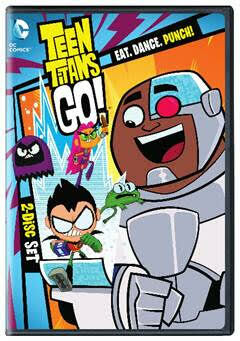 “Fans can get excited about yet another installment of the ever-popular Teen Titans Go! animated series,” Thomas stated, in a very succinct summation of the appeal of Teen Titans Go! fans: Eat. Dance. Punch! Season 3 Part 1.